Even thought the warmer months are here, if you live in New England, then you know that the weather is always unpredictable. One minute we are having a heat wave or summer like temps (which for us is usually in the mid 70's) and the next it is back to being cold (around the high 50's to low 60's). But, having grown up in New England I am used to the weather. And, while others are prepping to opening their pools for Memorial Day Weekend, we have learned to hold off a few weeks longer until it actually gets warm and stays warm and head to the beach instead, if the holiday weekends ends up being a hot one. Unfortunately, this weekend's temperatures are only in the mid 60's, so not beach weather for us. Instead, we are sitting by the outdoor fire pit keeping warm, while roasting marshmallow and making S'mores, and enjoying chili and soups for dinner. 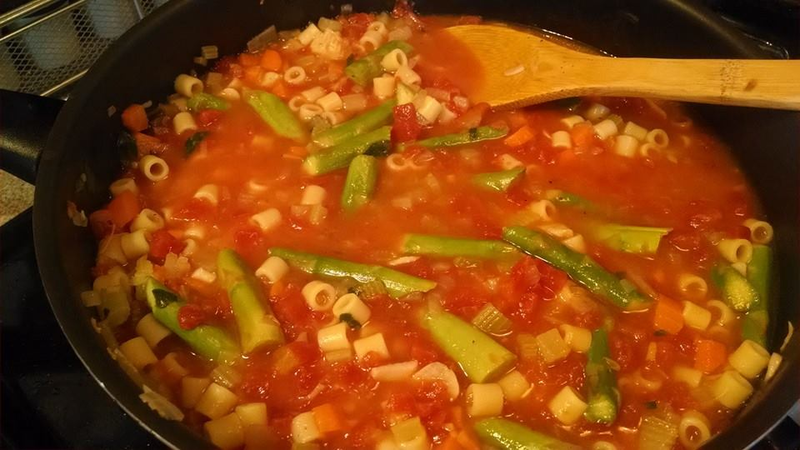 Here is my homemade vegetable minestrone soup recipe, which was easy to prepare and had even my daughters, who are picky eaters, asking for seconds. 1 pound of beans -- you can use whatever beans you like, including green beans, fava beans, etc. If you use canned beans, like cannellini beans, make sure you rinse and drain the 15 oz. can first. Optional: Depending on what you have in your vegetable bin or garden, you can also add zucchini, yellow squash, etc. Just be sure to cube/dice to cook evenly. I also love adding 2 cups coarsely chopped fresh or frozen spinach (defrosted), to give it a more earthy feel. 1. Bring a small pot of water to boil on high heat. While the water boils, peel and mince the garlic. Then, small dice the celery, peeled carrots and onion. Remove the fresh parsley leaves from their stems and rough chop. Zest the lemon, making sure not to get to the white pith part (which is bitter). Once you have zested the lemon, cut the lemon into quarters and set aside in a bowl. Snap off the woody ends of the asparagus and toss; then cut the remaining asparagus on a diagonal into 1-inch pieces. Depending on which beans you end up using, shell the beans. 2. Heat a medium pot over high heat. Then, add in 4 tsp. of olive oil and heat until glistening. Turn heat down to medium and add the garlic, celery, onions and carrots, and cook until softened, about 3-5 minutes, stirring occasionally. Season with salt and pepper. 3. To the medium pot of veggies, add in the vegetable broth, diced tomatoes with juice, lemon zest and 3 1/4 cups of water. Stir together and bring to boil over high heat. Once it begins to boil, reduce heat to medium-low and simmer for 5-6 minutes, or until the liquid is reduced slightly. 4. Depending on which beans you use, blanch them as needed. For instance, if you choose to use fava beans, you will want to add the shelled fava beans to the small pot of boiling water and cook for 1 minute until bright green in color. Then, remove and rinse under cold water to stop the cooking process. Once cooled off, squeeze the fava beans out of the outer skin, discarding the skin. Set the beans aside, as you will add them near the end of the cooking. If you end up using green beans or other softened beans, no need to blanch. Simply remove from their shells and set aside until ready to use. You can also use frozen beans. Just make sure to microwave for 1 minute to defrost prior to adding in the final step of the recipe. 5. Add the ditalini pasta to the soup, which has been simmering. Cook for about 10 minutes, or until the pasta is al dente. You will want a little bite to it. Be sure not to overcook, as the pasta will get tough. 6. Once pasta is al-dente, add the asparagus, half of the rough chopped parsley and half of the grated cheese (again your preference of either Parmesan or Pecorino Romano). Season the pot with salt and pepper, adjusting to your taste. Stir occasionally for about 2 minutes. You want the asparagus to turn a bright green color and the cheese to become incorporated into the soup broth. 7. Remove the soup from the heat and squeeze 2 lemon wedges into it. Add in your beans of choice (green beans, fava beans, etc). Stir to combine. Taste and add additional salt and pepper, if needed. Let the soup sit for a few minutes to let the beans warm up, prior to serving. 8. Spoon soup into bowls, and then garnish with remaining parsley and grated cheese. Serve warm, with remaining lemon wedges on side for additional garnishing. As for the pop clip holder, this sure did come in handy when it come to the stirring occasionally steps in the above recipe. I lack counter space in my kitchen, so I oftentimes find myself trying to juggle wooden spoons off of the spoon cradle on the stove or lay them over the pots, only to burn myself when I reach for them without a pot holder. Now I don't have to worry about taking up limited counter space to lay my wooden spoons down, or have to fuss with them not staying put in the cradle on the stove. This nifty pot clip holder works with most wooden spoons, and is a must have for any cook. If you have visited my blog recently (which I hope you have) :-) then you have probably seen the Good Cook "Build Your Kitchen Drawer" Countdown clock on the left-hand sidebar. Well, for those wondering what this is about, here is more about a fun sweepstakes kicking off on June 2nd, where you will have a chance to fill your kitchen drawer with new kitchen tools and gadgets from Good Cook. Does your kitchen drawer need to be updated? Or, do you find that you don't have essential kitchen tools and gadgets when you find time to get into the kitchen to cook and bake? Well, leave it to the folks at Good Cook to help you build your ideal kitchen drawer, with their upcoming sweepstakes that kicks off on June 2nd and runs through July 14th. The Good Cook "Build Your Kitchen Drawer" Sweepstakes will kick off with a fun 5-day product giveaway on Facebook from June 2 - June 7th, where participants will win selected products that they can add to their kitchen drawers. 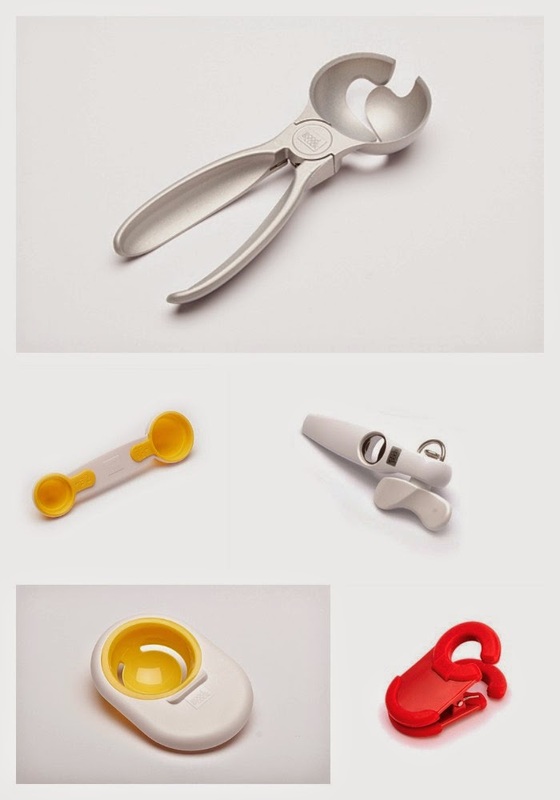 Your can build your ideal Kitchen Drawer filled with great Good Cook tools and gadgets. During the sweepstakes, visit goodcook.com and choose up to 15 items from selected Good Cook products to create your ideal kitchen drawer. Then, enter to win everything you've selected. If you can’t decide what you want, you can let the Kitchen Experts help - simply choose one of the featured Kitchen Expert Blogger drawers and enter it for a chance to win. Also, there will be Instant winners! Every drawer entered has a chance to win an instant prize, and participants can submit a new drawer every day for a chance to win. 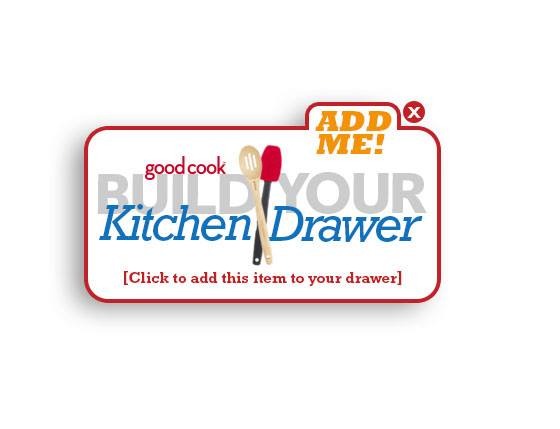 Look for the “ADD ME” icon below on any participating product found at goodcook.com, and add that item to your drawer, for a chance to win your selected items. Oh, how I wish I could participate in this sweepstakes, as I would love to through out some old kitchen gadgets and replace them with new ones from Good Cook. But, at least I was able to receive the 5 must have kitchen essentials I talked about above, and find myself reaching for them all the time. FYI...During the upcoming "Build Your Kitchen Drawer" Sweepstakes, everything on goodcook.com will be 25% off. But, make a point to enter this fun sweepstakes as you will have a chance to win instant prizes, as well as additional discounts. Can't wait to see if any Inspired by Savannah readers will walk away with a drawer full of new kitchen tools and gadgets from good cook as part of this upcoming sweepstakes. So, please share if you are lucky enough to win instant prizes, daily giveaways and more. :-) Good luck! Don't forget to follow Good Cook on Twitter (@GoodCookcom) and enter to WIN in the upcoming "Build Your Kitchen Drawer" Sweepstakes kicking off on June 2nd. I have never had asparagus in my soup, I will have to test this one! Wow this soup look beautiful and super healthy. I love asparagus and would love to try out this recipe. These utensils look super handy.